Health and lifestyle is important for anybody who is in business. Now whether you are the owner, whether you’re running a marketing team, whatever you do, I want you to think of you. 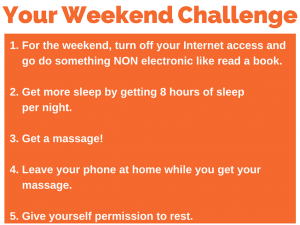 So, the weekend challenge is for you to get some downtime. Some of the things on this list will sound impossible. But if you try them, you might like it and like everything, it doesn’t cost you a darned thing. By the way, if you’re wondering about the weekend challenges, there’s one every Friday. If you go to the Marketing For Owners and look for the tab that says “Great Tools.” — simply click that and choose the link that will lead you to all the weekend challenges. It is all the way back from number one, and you will find them all in one place. These are a great way to get some things accomplished. Now — let’s talk about scheduling some down time. This thinking comes from and recommended by my friend Carolynn, who is a a wonderful masseuse that I know and certainly helps me a lot in that department with the healthy lifestyle thing and with her advice. She’s based at hernebaymassage.co.uk in the UK, and she does a fantastic job and is good at online marketing. But this also comes from –Strategic Coach, which I happen to be a member of. They encourage people to work on working their days and to make sure they get free days. A free day is with no work and is very difficult. So without further ado, get your pen out or a pencil, get a pad or just a piece of paper. Nothing electronic because that won’t work as you’ll get in a minute. Number 1 — Your Electronic Usage: I’m going to ask you to attempt to turn off your internet or broadband for the day. “What? !” you are saying. Yes. Now, this is on a day on the weekend. You may have a family. You may not. Believe me, before I had a family, there wasn’t any broadband. There wasn’t any Internet. But I worked. I thought I had to work so I did work. It was boring. When I had a family, I’d stop working weekends. It didn’t make any difference to my work schedule, everything got done when it needed to be done. So I want you to attempt to turn off broadband and go and do other things or read a book. Yeah, that means Netflix, everything. One day. Is it going to kill you? Try it. You’re going to burn out. Or those that say, “I need 12 hours.” You’re possibly getting too much. Just a thought; get more sleep. Ariana Huffington, very famous; one of the tips she gave in her book Thrive, she was given by a friend. She sets an alarm for when to go to bed. We set one for when to get up. We don’t set one for when to go to bed. So try and get eight hours. Remember, eight hours of sleep; not eight hours of going to brush your teeth and get undressed, etc. Eight hours of sleep. Don’t have any electronics. Don’t have the TV on. Bedtime. Number 3 — Why Not a Massage? Unsurprisingly, this comes from Carolynn; get a massage. Have you ever had a massage? More women will be used to this than men and they’ll know how it relaxes things. Women have manicures, pedicures; love them. Obviously men don’t generally have that kind of stuff but it’s a whole relaxing experience. I have regular massages. Yeah. Laugh, laugh, laugh. No real massages. It’s wonderful. The way you feel afterwards is fantastic. When I fly back to the UK I suffer from jetlag. It’s unavoidable. The older I get, the worse it gets. I go see Carolynn. She gives me a jetlag massage. She told me that’s what it is and it gets rid of it. It’s absolutely amazing. The next day, right as rain. It’s unbelievable. No idea how she does it but massage therapists are trained. They know what they’re doing; well, if they’re like her. Pick yourself a good one. Get a massage. Number 4 — Leave the Iphone at Home: When you go out, leave your IPhone at home. That’s like switching off broadband, isn’t it? Scary. Or if you think “Oh, I have to have it,” switch it on to airplane mode. It’s simple. See if you can go without it. Now, I know you’re going to say, “But what if someone wants to get a hold of me?” Trust me. I’m a lot older than you. We had no mobile phones. I was around when they were invented. I actually cold-called in my days of a door to door salesman in the eighties. I cold-called on vodaphones, offices in Newbury when I had two industrial units next to each other before they became a behemoth. There were no mobile phones. We did fine. No one needed to get a hold of you. It was fine. You’ll be okay. Try it. Try for half a day. If you don’t do it for the whole day, try it for half a day. Number 5 — Just Rest: A final one is give yourself permission to rest. Do you ever get the day when you think “I’ve got too much to do”? Hmm? I do. Give yourself permission to rest. It will wait. It just will. Take a break to have a rest. You will feel refreshed and you’ll get back to it. Another trick by the way with that in mind is that you are at your most energetic in the morning, not late at night. Do your work in the morning, get it done before your energy wanes or sags. If your energy levels are up here in the morning, they’re down here in the afternoon. It’s going to take you twice as long to do anything in the afternoon. Do it in the morning before you get bored. Get up earlier. Remember the episode where I told you to read The Miracle Morning book by Hal Elrod? That’s all in there. Please. These things are for you, for your health, for your long life and for your family. 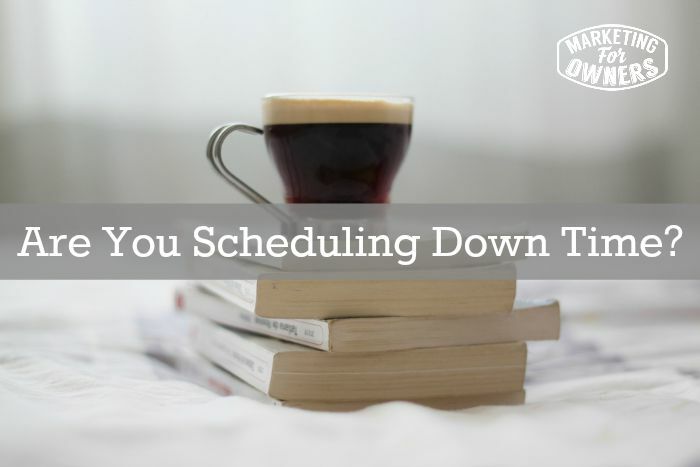 So, schedule downtime. Try it. Try these things. I don’t force you to do them. But I’m telling you that they work because I’ve tried them and the reason I’ve tried them is because others have tried them and told me to try them. It’s not stuff I just make up for the heck of it and sell to you. It’s free. Go for it. You won’t regret it. Even if it’s one, your kids certainly won’t regret it. So, that’s your weekend challenge. I’ll speak to you soon. Have a great weekend. 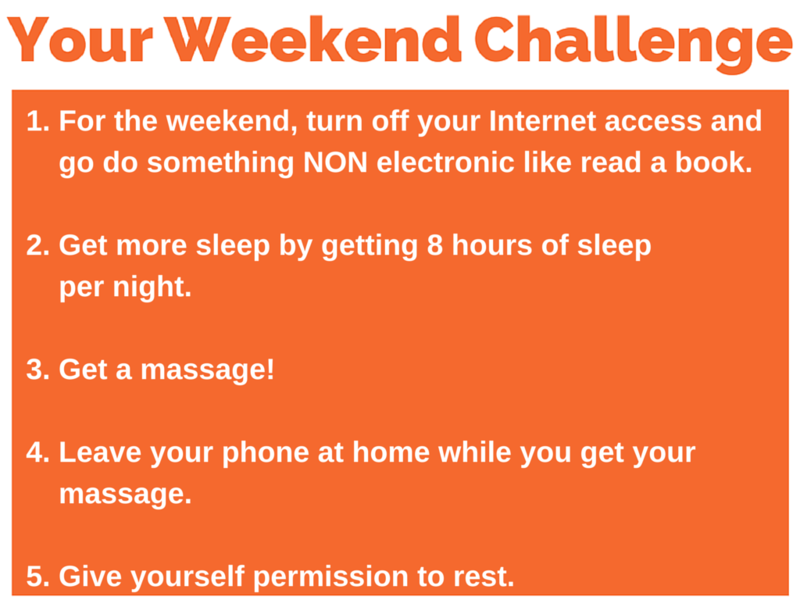 Which of these can you do this weekend to get some downtime?